U.S. 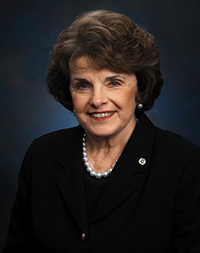 Senator Dianne Feinstein has agreed to serve as honorary co-chairperson of the 2016 California Economic Summit. She joins former Secretary of State George Shultz and former Secretary of Defense Leon Panetta as honorary co-chairs for the Summit. The Summit champions solutions to meet California's triple bottom line of a growing economy, improving environmental quality and increasing opportunity for all. The Summit released its 2016 Roadmap To Shared Prosperity earlier this year. Summit Action Teams have been working to develop, advocate and implement ideas that will advance prosperity in California by expanding our workforce, housing and water sustainability capacity. One million more skilled workers: With wages stagnating and income inequality rising—and millions of Californians struggling to make ends meet in low-wage jobs—industries from health care to manufacturing are still struggling to find skilled workers. The Summit has set a goal of closing this looming “skills gap” by supporting the formation of regional civic organizations that can align the state’s expansive training and education programs with the needs of employers. One million more homes: With housing supply falling far below demand—driving up housing prices and rents beyond what millions of Californians can afford—the Summit will lead a comprehensive effort aimed at reducing the costs and increasing the supply of all types of housing near transit and jobs. One million more acre-feet of water each year: With Californians using substantially more water each year than the state’s infrastructure can reliably supply, the Summit will also support the expansion of watershed management solutions that can help regions conserve, capture, and reuse enough water to achieve a sustainable water balance.